Discussion in 'Transformers 3rd Party Discussion' started by Fulano de Tal, Feb 16, 2018. How avant-garde of you, Trailbreaker! Mine arrived with extra blue paint on his nose. Since he'll have to have some paint touch-up anyway, I'm considering just making his face black. Might lose some of the definition of the features, but I tend to like my Trailbreakers with dark faces. It's like someone tried to give him a Hitler-stache. Does the waist lock in in any way? I've got the shoulders, backpack and chest nice and secure, but the way the waist flips and slides around is still loose for my taste. It's easier to move that than the intended ab joint. It's funny, this has the lowest quality (tightness) of all the MS figures I have, but it is my favorite. The sculpt/head/colors in both bot and alt modes are perfect as far as main figure. Actually it is the best of any legend figure I have period. Don't like the shoulder gun so I don't use it . This might be my favorite MST release to date. I’m a bit biased tho as we used to have an ‘84 Toyota 4x4 with camper shell that we used to go camping and sleep in the back of. Great likeness. Fun transformation. I did tighten the torso screw a bit to remedy that being a little floppy. At 10cm he’s large enough to generally fit in amongst a mixed lot of legends and legends+ scaled toys. He's a bit shorter than Hot Soldiers Ironhide but I think he looks ok (until MFT upscales one.... ). That's where I'm parking him for now as I just can't get into the MST carbots with those goofy faces. He's one of those characters that I'll buy no matter what and find a place for him. Ironhide, Ratchet, UM and Dinobots fall into that group for me as well. Ol' Trailbreaker hasn't had as many "at bats" as the other guys so it is nice to get one. His chest and shoulders are actually the same height as HS Ironhide. The only thing that makes him slightly shorter is the scale of his head. Otherwise they would be exactly the same height. Received Magic Square Trailbreaker today. Really like the figure. The transformation is more intuitive I think than some of the others. I worked it out without the instructions. 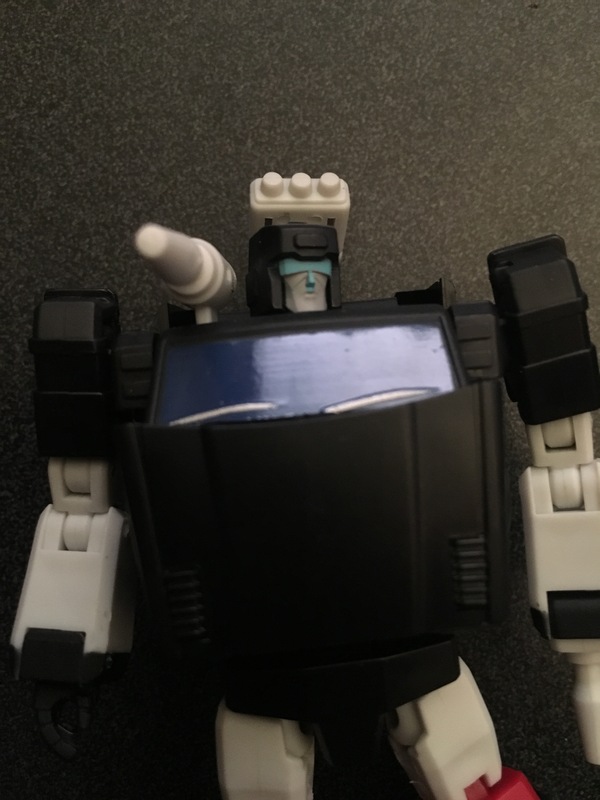 I've never had Trailbreaker before. He was always a character that I enjoyed but not so much that I really wanted the figure. I liked the MST version enough that I wanted to add him to the crowd. Everyone should buy this toy. Once you tighten up the waste slide screw a bit he becomes the crown jewel of Legends-scale engineering; worth mortgaging your firstborn child for. He is almost my favorite legends figure i own. Best look for sure. He is also the one with most loose joints, and not just fixed by tightening the screw on the waist on my copy, i need probably apply future floor on a few of his hip area joints. But even with that, he just looks the best in both modes, and my favorite. Nicest face ever too. I just got magic square trailbreaker from eBay. He's my first magic square figure and I love the design. Unfortunately my figure is defective and has 2 right shoulders. I can't transform him because I need a left shoulder to fit in the car mode. I've tried sending a message to the eBay seller. In case he can't help me, would anyone happen to know if there is any way to contact magic square directly? I'm new to legends collecting. Does this happen often? Thanks in advance. Unlucky, you can contact them on weibo. I would think the have to send you a whole new figure. it's the slider for the top half of the torso, tighten it slightly and the slider becomes stiffer but the torso also more secure. There's no harm in doing it and only positives. Thanks. I'll try posting on weibo. I found their website from a separate thread. Unfortunately I can't read Chinese. I'll post the result in case anyone else runs into a similar problem in the future. It's such a shame because I absolutely love the figure. Great design and overall quality compared to some of the hot soldiers and mft legends figures I got.. I have an issue with hs prime, two right hip pieces, and i recommend taking it up with the person you bought it from reserve feedback until it is sorted . I will be. Failling that take it up on weibo. Really? I mean, I see you're laughing, but this post would make one think otherwise. I mean, his was funny because it's silly. Your post was kind of a buzzkill, man. You guys weren't kidding, this guy is great. As I was transforming him I was like, whuuuuut... This guuuyyyyy... How did they doooooo thiiiis. So many little flips and twists and voila, a snug little pickup. And I have their Grapple and Sideswipe, so it's not like I'm new to their stuff.. this guy is just really neat. That slider screw on mine was so loose that the windshield could pivot on it. It was confusing the first time I messed with it and I was pissed, I thought it was a defective POS. All that changed after I realized it was an easy fix. Awesome figure (besides the loose waist). A couple upgrades and a resize, he would make an awesome MP that would be fun to transform (which the current options are definitely not). I especially like that you can leave all his weapons in place while you transform him (aside from his hand laser).